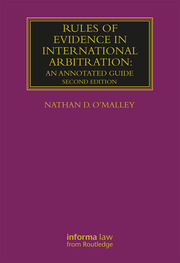 Arbitration has become increasingly popular in the field of dispute resolution; this series expands on the expertise that we have developed in this area, and provides you with a dedicated library of commercial arbitration titles. Specifically designed for commercial practitioners and arbitrators, this series offers analysis and guidance on the very latest issues in the field. * Offer cannot be used in conjunction with any other offer or discount and only applies to books purchased directly via our website. Offer expires 30th April 2019.